Want a stock that's not on our list? Don't fret, we may be able to get it for you! 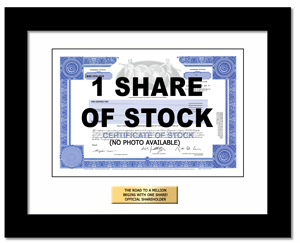 In many cases, we can get stocks that are listed on the NYSE or NASDAQ. Orders are subject to review for availability. Custom orders are only offered in our Premium Frame (price includes one share, custom frame, mat, and personalized engraved plaque). First, we research to make sure we can get the stock and if there are any transfer agent fees - we let you know either way within a couple of business days. Note that our system automatically charges your credit card for the fee noted below (does not include the market price of the stock or transfer agent fees, if any) when you place your order. If we can't get the stock, we promptly refund the entire amount. If we can get it, we then charge your card for the remainder (market price of the stock) and send you a revised confirmation. Delivery is generally in 6 - 9 weeks (instead of normal 3-7 weeks) because of the extra steps. 2 Part Delivery is generally not available because we do not normally have a copy of the certificate. Your credit card is charged for the amount noted PLUS the current market price of one share of stock. We will send you an email with the final amount.